Non Stop Sound is equipped with all the latest equipment, lighting, and music to illuminate your special day. 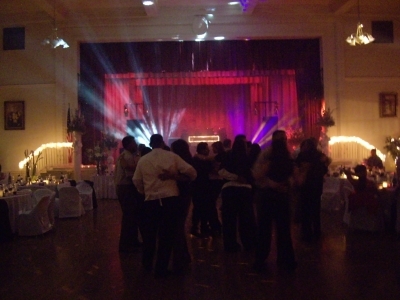 We offer JBL amplified sound systems and JBL concert sound systems for large events. All lighting is intelligent and works best with smoke where allowed. Microphones are Shure & Sennheiser Wireless Systems and are provided for officients, singers, bridal party toast, and announcements. All music is mixed professionally with Pioneer DJM 1000 C.D. players and played according to bride and grooms request. Our appearance is most important and all systems look unique and state of the art.